PayPal Holdings, Inc. operates as a technology platform company that enables digital and mobile payments on behalf of consumers and merchants worldwide. Its payment solutions include PayPal, PayPal Credit, Braintree, Venmo, Xoom, and Paydiant products. The company's platform allows consumers to shop by sending payments, withdraw funds to their bank accounts, and hold balances in their PayPal accounts in various currencies. It also offers gateway services that enable merchants to accept payments online with credit or debit cards. The company has a strategic partnership with American Express Company to improve the digital payments experience for the United States American Express Card members paying with PayPal and Venmo. 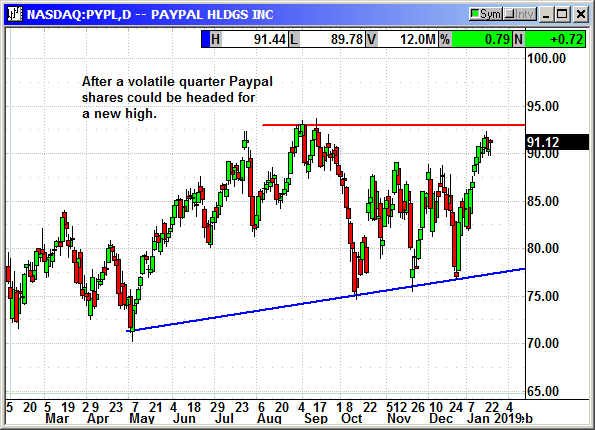 PayPal Holdings, Inc. was founded in 1998 and is headquartered in San Jose, California. Company description from FinViz.com. Morgan Stanley said Paypal is crushing digital payment competitors in the e-commerce space and extending its lead. The analyst said Paypal is now accepted at 82% of the top 500 US internet retailers compared to only 12% for Amazon Pay. Only 4 accepted Bitcoin. Paypal added another 8 retailers in Q4. Their total payment volume continues to grow at a rate faster than the growth of ecommerce. Paypal has offered $500 in instant credit to any federal employee impacted by the shutdown. The offer was a $25 million pledge by Paypal to help workers experiencing a hardship. There is no interest and the offer is good until the government reopens. It is these kinds of marketing opportunities where Paypal excels and this is why their brand is growing. They offer convince of not having to input your payment details in every website you visit. The entire process is super simple, and your privacy is not at risk. I personally purchased 4 items at different websites over the last two weeks on Paypal because of the easier transaction. The stock had a rough three months from October through December but is now on the verge of breaking out to a new high. Buy Jan 2020 $100 call, currently $8.15, stop loss $85.35. Optional: Sell short Jan 2020 $75 put, currently $3.85, stop loss $85.35.